What are your thoughts when you hear that there is going to be terrible weather on your wedding day? Maybe you want to change the date or you rush to find a venue that has an indoor facility. I am sure that there are many things that go through the couple’s heads and the families involved. At this point you are planning your whole wedding again in a very short period of time. This seems impossible, who could plan another wedding that is pretty close to perfect in the middle of a terrible storm. This nightmare became reality for one Virginia couple because of hurricane Florence. Tiffany and Dustin had the perfect wedding planned out in the Outer Banks. They were staying at a resort and were getting married on the beach. They arrived to the Outer Banks the Sunday before the wedding, that was scheduled for that next Saturday. Tiffany and Dustin, with their families, were ready for a week of relaxation before the wedding. This relaxing time came to an end when hurricane Florence was making its way to the Carolinas. They arrived on Sunday and there was a mandatory evacuation on Tuesday. They suddenly switched gears and made their way back to Virginia along with trying to find a place to have their wedding. Let’s back up to the Monday before Tiffany and Dustin’s wedding at the venue they chose for their wedding the second time, Bandit’s Ridge. I am the manager and on sight coordinator at Bandit’s Ridge and I can tell you first hand that, us at Bandit’s Ridge, are very giving and just want every couple to have the perfect wedding. All of us were keeping track of the hurricane as well and noticed that all the wedding Facebook pages were full of couples looking for indoor facilities. Donna, the owner of Bandit’s Ridge, was ready to let people know that her place was open. We had an event planned for that Saturday, that got canceled so we were available. Donna put a post on her Facebook page and on other wedding Facebook pages announcing that her facility was available for an indoor wedding. There was a lot of responses and many phone calls within two days. The couple that was the first to make a move was Tiffany and Dustin, so they booked the venue for that Saturday. There was a lot of planning that had to be done in less than a week. We had to find all new vendors for the couple and plan the layout for the ceremony and the reception. We wanted to do something special for them, so we decided to do all the flower arrangements for them and also since they couldn’t get married at the beach, we decided to bring the beach to Bandit’s Ridge. Donna and I went and got flowers, greenery, birch wood, sand, and some tropical trees along with some other things to make the wedding perfect. Decorating was easy because the couple had already bought all the décor for their wedding in the outer banks and it was all beach themed. For the indoor ceremony we built a birch wood arbor and put down sand where they stood, this was a huge surprise for the two of them. We used lanterns and shells that were provided by the couple on either side of the arbor making a half circle. We were able to rent some tropical trees and bushes from Strange’s to have the feeling of the beach in the building. 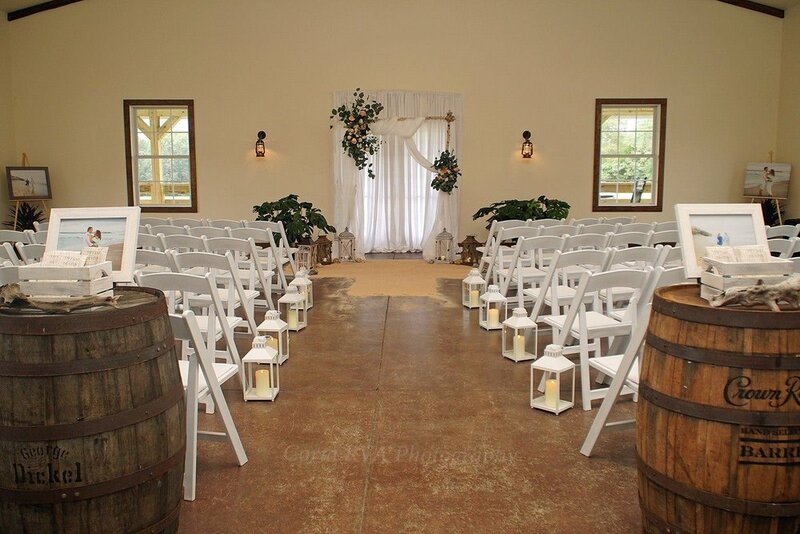 The aisle was lined with white lanterns on either side with candles to set the mood for the evening. The most difficult part was the building of the arbor, with all the weight from the flower arrangements that we made and the white sheers, made the arbor top heavy, making it fall over. We had to tie the arbor to the doors to help it stand. We had a lot to do in short period of time but had it all done, with time to spare, before the ceremony. I was told before the ceremony that Tiffany and Dustin had planned on walking barefoot down the aisle when the wedding was at the beach. Before Tiffany walked down the aisle I asked her if she wanted to take her shoes off before she entered the building, I also let her know that we had a surprise in the building for her. So she kicked her shoes off and entered. As soon as she got up to where the love of her life was standing, she started crying and we knew that we had pulled of a beautiful wedding that Tiffany and Dustin would remember forever.